Celebrating Women's History Month, March 2015. 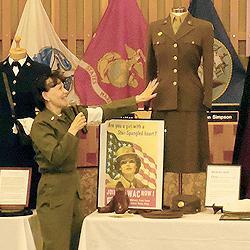 Alice, dressed as a Korean War-era nurse, shows off a WAC (Women's Army Corps) uniform from World War II. Part of the WAC uniform: the "Hobby Hat", named for Oveta Culp Hobby, first Director of the WACs. By way of answering, she displayed a number of choice items from the extensive collection of women’s service uniforms she and husband Steve Miller have collected over the years. Recently honored by the US Army’s Western Regional Medical Corps Command Team with a plaque and “Challenge Coin” in appreciation of the many displays and presentations she has arranged and delivered over the years for museums and military organizations, Alice brought history vividly to life, sharing stories—not only of individual uniforms, but of the people who wore them—with a fascinated audience at Lakewood City Hall. 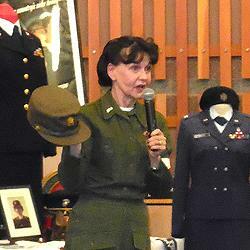 In her previous, highly-praised and well-attended appearance for the Lakewood Historical Society, Alice embodied a World War II era WASP (Woman’s Airforce Service Pilots) for our Women’s History Month presentation, "Women in Aviation: Then and Now" in 2013. 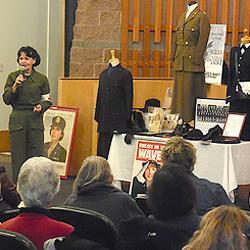 Last October, dressed as a first World War nurse, she entertained and enlightened the crowds at our joint fund-raiser with the Tacoma Historical Society held at Joint Base Lewis-McChord. Sponsored byThe Suburban Times, the program was FREE and open to the public.